We went to a birthday party this afternoon and there were lots of kids there. 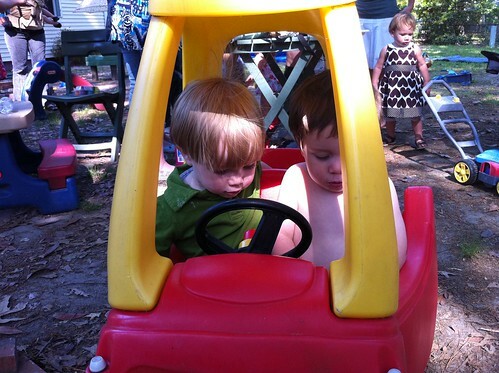 Ian was super shy at first but warmed up to the idea of the toy car. Unfortunately, there was another little girl in a pretty brown dress who was interested in it as well. And we had our first experience of a "NO!" standoff. It's hard being a little kid. A bit later he did manage to share the car with another little boy. I don't think he got much choice, though. Ian was just driving along and this half naked little dude with shaggy hair and piercing blue eyes flagged him down and then hopped in. As they motored across the yard, diaper dude put on his green star-shaped shades. And I heard the "YEAAAAAHHH!" from CSI: Miami in my head.